Ever wonder how historic politicians measure up to today’s electoral circus? 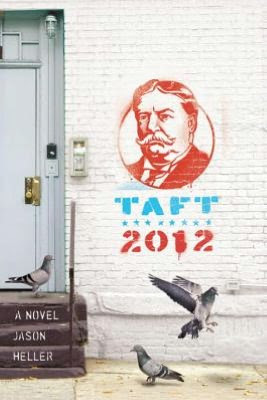 TAFT 2012: A NOVEL by Jason Heller (Quirk Books) tackles that question with an entertaining plot twist, bringing back William Howard Taft from 1913 and plunging him into the bizarreness of 2012. Taft has to navigate social waters he never imagined, from television studio audiences to the proper way of escaping from an impromptu and ill-advised New Year’s Eve celebration underneath a strange woman. Taft’s journey through a world he never wanted to see is intriguing and reveals much about how politics have changed through the years, and how much they haven’t changed at all. Heller’s side bits of talking heads on television and social media commentary is so spot on, I had to put the book down occasionally. The political fighting in-book gave me the same twitch it does in real life, so kudos to the author for authenticity. He casts a light on the constant, ever-hungry media and its role in politics. I also liked Taft’s relationship with Irene; to me, that felt more like the heart of the book than his relationships with descendants. I did think the main issue of artificial food was featured too much throughout the book. I love a good running joke as much as anyone, and I understand that issue was used to avoid any of the lightning rod issues that get so many people’s knickers in knots today, but it could have used a lighter touch. I also wanted to know more about how Taft got here. I was expecting some scientific or mystical group who found a way to boot him from their own century, not that he just fell asleep and nobody noticed some giant dude on the White House grounds for 100 years. While the Rip van Winkle device keeps the reader focused on the politics, a richer plot could have been immensely entertaining as well. Overall, this is a great book to read in an election year, especially since this year is packed with posturing and never-ending debates. It also makes you wonder how many other historical figures would deftly defend themselves against a plugged-in populace and rabid media if given the chance. TAFT 2012: A NOVEL by Jason Heller is available in any format you like, including paperback, Kindle and Nook.